I know, I’m stretching it somewhat. It’s short—off the cuff—and not even what you’d call a review, but it’s more than worthy of inclusion here. 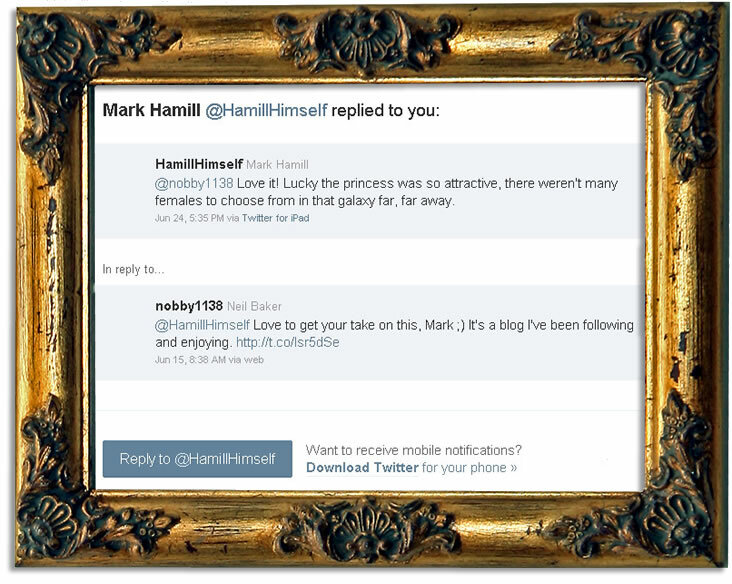 It’s Mark Hamill for goodness sake! When I made this comic, he was my hero! Sad person that I am, I even framed it—in Photoshop— for your delectation! ONE Saturday afternoon in 1977, a nine-year-old boy came home from seeing Star Wars for the first time – and started drawing. Like children the world over, John White, of Ballymore Eustace, County Kildare in the Republic of Ireland, was desperately trying to preserve that life-changing experience in his memory, aware that it might be years before he saw the movie again.